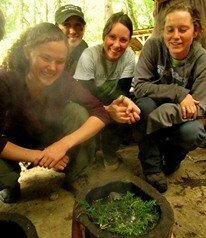 Leah Houghton is an experienced wilderness skills educator and permaculturist. She wrote articles for the Alderleaf website while teaching at Alderleaf. She has worked as a camp director in the remote wilderness of the Cascade Mountains teaching children outdoor skills and horseback riding, as an instructor at Quiet Heart Wilderness School, and in a Montessori classroom. She holds a Level III Track & Sign Certification and a Level II Trailing Certification from CyberTracker. 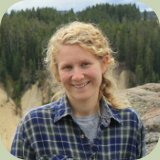 Leah is a graduate of the Wilderness Instructor Apprenticeship Program, Advanced Wilderness Skills Program, and the Alderleaf Wilderness Certification Program. Leah enjoys practicing homesteading skills such as gardening & food preservation and has experience raising & processing goats, rabbits and chickens.